Just a really good work of contemporary literary fiction. The characters all had rich histories and the author did a tremendous job at interweaving excerpts from A.N.Dyer’s collection of fictional novels. Yes, as other reviewers have commented, it is pretentious at times, but this is the nature of a work like this. Our narrator is oftentimes a confusing choice and I feel like there could have been a few more opportunities to explore Philip Topping’s surreptitious role in all of this. The writing and word choices are engaging and David Gilbert offers the reader a great deal of humor along the way. My favorite chapter was definitely the one with the pretzel scene. I wish there was actually a bit more depth to the Andy/Jeanie relationship, and Isabel really deserved another appearance, but this is a novel about men. Fathers & Sons, more specifically, and any divergence from this might have only lessened the theme. Recommended! 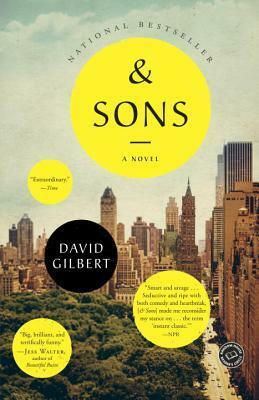 This entry was posted in Book Reviews, Other Stuff and tagged Book Reviews, David Gilbert, Fiction, Novels. Bookmark the permalink.